Kid’s World Child Enrichment Center, Inc. provides a safe, nurturing and educational environment in which all children are provided the opportunity to grow physically, emotionally, socially and intellectually. Kid’s World Child Enrichment Center, Inc. provides a safe, nurturing and educational environment in which all children are provided the opportunity to grow physically, emotionally, socially and intellectually. Quality childcare is a top priority for dual income and/or single parent families. Kid’s World Child Enrichment Center will work in conjunction with parents to provide quality childcare for children ages infant to 12 years old. The center maintains an “open door” policy at all times. 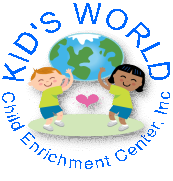 Kids World Child Enrichment Center, Inc. is licensed to care for 10 infants (ages 0-2) and 60 children 2-12 years of age. Hours of operation of the center are from 7 a.m. to 6 p.m., Monday through Friday. The center provides childcare services for children infant to 12 years of age. Age appropriate care, educational materials and instruction are provided to children based on their classroom status. Five separate classrooms are provided based upon the ages of the children. These classrooms consist of a newborn room for ages 0 through 6 months of age, an infant room for children ages 6 months to 2 years old, a toddler room for children ages 2-3 years of age, a 3-4 year room for children ages 3-4 years old, and a Pre-K room for children ages 4-5/6 years of age. Kids World also provides before/after school care for children requiring supervision before and after attending public school, as well as a summer program for school aged children. Kid’s World Child Enrichment Center, Inc. understands the importance of appropriate educational experiences and their role in the success of children as they develop and grow. The center offers a variety of developmentally appropriate educational programs to help prepare children for the challenges of kindergarten and beyond. Care that is warm and responsive is essential for newborns and infants healthy development. Kid’s World Child Enrichment Center, Inc. will enrich baby’s environment with soft and colorful toys, music and personal interaction. Toddlers are ready to explore and discover the world around him or her. Kid’s World Child Enrichment Center, Inc. encourage a toddlers’ sense of discovery in a safe, nurturing environment providing a colorful, enriching environment with age appropriate educational toys, materials and instruction. Three and four year olds are anxious to express their independence. Kid’s World Child Enrichment Center, Inc. encourages this desire while setting age appropriate boundaries to ensure the safety of all children and staff members. Three and four year olds will be given the opportunity for new learning experiences through the use of educational toys and games, materials and instruction. Pre-K students are provided the opportunity to engage in traditional educational studies through our preschool curriculum. This curriculum will be provided within a fun-filled learning environment to ensure learning is rewarding and enjoyable for all children. Before/after school care and the summer program meets the needs of school age children and their parents. Age appropriate activities such as arts & crafts, cooking, music, outdoor play, field trips and assistance with homework are offered. Staff will assist with children at the school bus stop, ensuring a smooth transition from center to school and vice versa. Kids World Child Enrichment Center, Inc. accepts enrollment for full-time, part-time or pre-school only hours. The center also gladly accepts best beginning scholarship assistance.